Into The Unknown part 1 – MostlyAboutBeer……..
On the bars in Britain there are fewer and fewer permanent taps. Once a pub without a Guinness, Fosters or Heineken badge was unknown – now it’s increasingly common. When I enter a pub I’m drawn first towards the round oaken cask beer pumps. They stand polished, reassuring and defiant. Brewers deliberately go for a unique shape to their pump clips. The Thornbridge shield, for example, can be identified by silhouette from the street outside. The craft keg taps are more reminiscent of the detail on Isaac Asimov paperbacks – gleaming alien antennae or eye stalks hovering over the bar. You need to scrutinise them more closely. Walking into a decent pub now requires similar actions as going into a library. You inspect the clips and badges like you do the titles of books on the shelf. Any tasting notes on the clip become the blurb on the back cover. Basically, you browse, rubbernecking around humans and other obstacles. 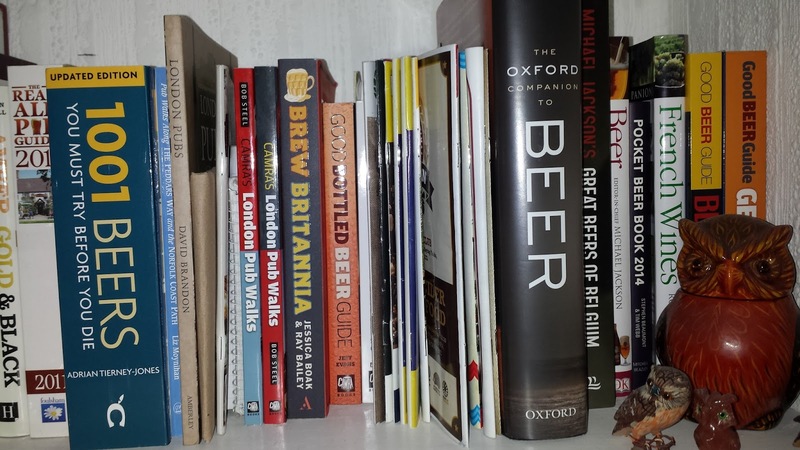 In quite a few pubs where beer is the focus, looking around at the other punters you could be forgiven for thinking they’re there to study too – each lost in his or her own world trying to pin down the notes in the beer like an impregnable first chapter. The “permanent” is often on the end of the cask or keg tap line-up and there are two kinds of drinker – the ones inclined to go for the usual and the ones that decide to go for the unusual. Overwhelmingly, I’m the latter. I’m drawn to the unknown – unchartered volumes. In advertising, there is a much used tool called the sonic trigger. It’s used on television and on radio – usually towards the end or trailing the advert. It’s an auditory short cut that delves right into our memory banks. Jingles for products we may last have seen in our childhood can be instantly called back up. A good example is the four note trigger for Intel Inside or the five xylophone notes that are struck at the end of the Holidays Are Coming advert for Coca Cola – they instantly recall the luminescent snowbound lorry. There is a similar process to the sonic trigger involving sight and smell on the memory when tasting beer. When the sensation you’re anticipating doesn’t arrive and is replaced by another, however, you are forced to question what you thought you knew. When my palate is washed with what it’s unaccustomed to, it makes my mind crash and restart. My brain prizes open neural pathways to try and surround the imposter on a reconnaissance mission and start a file on it. With the unanticipated, I have to do a double take and zoom out mentally so what were once the edges of the map are pushed further into the centre and I can get a bird’s eye view at what they really are – localised districts within a bigger picture. It transforms a beer rule into a beer colloquialism. When this happens it’s akin to opening your eyes and realising you’re not where you remembered being when you shut them. The beers is this article all represent a deviation from the norm. They are here because they left a mark on me and subconsciously I’ve been cataloguing them. Newer breweries with myriad methods of dispense are represented in part one. 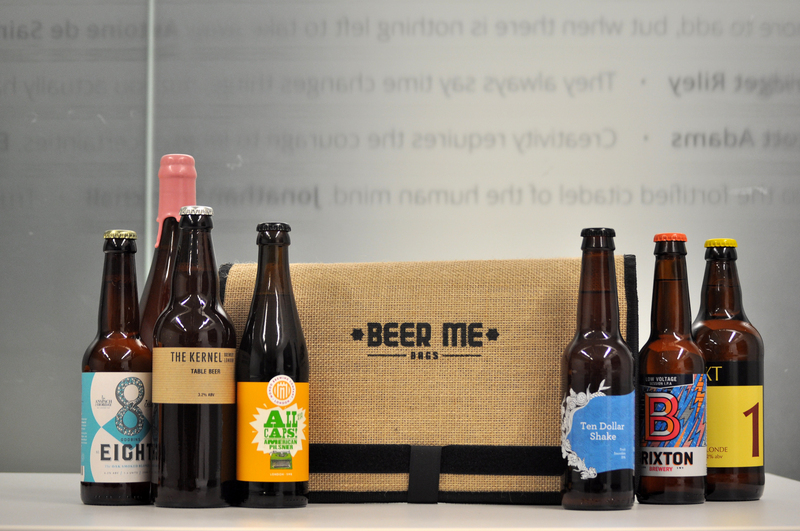 I’ve put them under two general themes for readability but in truth each beer is uncategorisable. Beer is the most versatile drink. Set free, it has started to stalk other members of the food and drink community. It’s blagging its way into cocktails. It has broken into, squatted and stolen the identity of spirit casks. It threatens white wine – intimating in hushed tones that it can compliment more dishes than it can. from a near identical stalked glass it whispers identical notes. For a while now it’s been hijacking dessert too. Might it have started becoming the dessert? If the following three beers were a bit thicker in body, then a dessert spoon might be entirely appropriate for them. 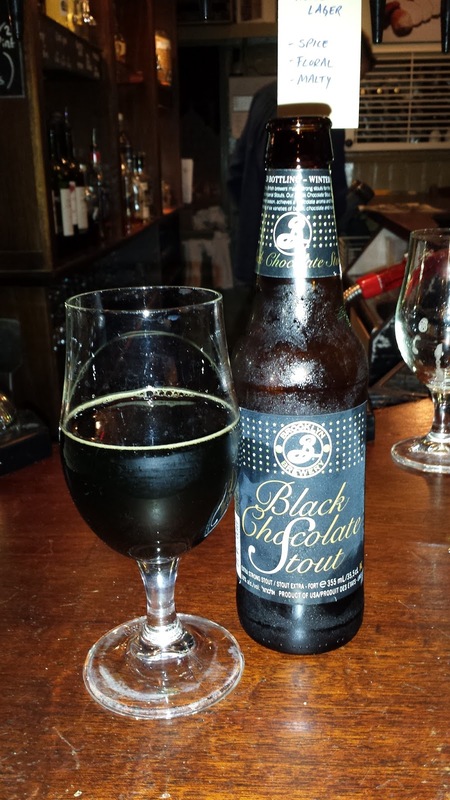 Chocolate or coffee stouts are nothing new. What’s happening now is that as much scrutiny is being put on the added ingredient as the beer that hosts it. It’s not simply bars of chocolate or a sack of coffee beans anymore. The provenance and ethos of the producer are just as vital. It’s now an unwritten rule that if there’s a local coffee shop the brewery elves visit, shagged out after a deep muscle mash, there is a collab beer with that fair-trade coffee shack in the pipeline. The coffee or chocolate is beginning to eclipse the water, hops, yeast and malt. It’s not enough to have a coffee beer. Coffee’s own portfolio is being subducted with relish by the brewery’s. You can have an espresso stout, a latte stout, a hazelnut and vanilla porter or a white coffee milk stout. It doesn’t end there. This subduction is now pulling in coffee’s accoutrements! The biscuits too were thrown into the copper boil – only the crockery escaping. There is digestive biscuit beer and a salted caramel beer. There’ll be a custard cream or hobnob one soon. Millionaire is a very dark chestnut brown and light doesn’t seem to impregnate it when held up. You need to shake a head up – you’ll get a mocca milk out of it. The aroma tells you this is going to be interesting as you get notes both of milk chocolate and the coast. The mouthfeel is like a silk lined duvet. I taste UHT milk and salted caramel. The sweetness is a bit like a masticated flapjack or a half digested coffee creme. Malty aftertaste. Kate and Anne are self-proclaimed cocoa girls. 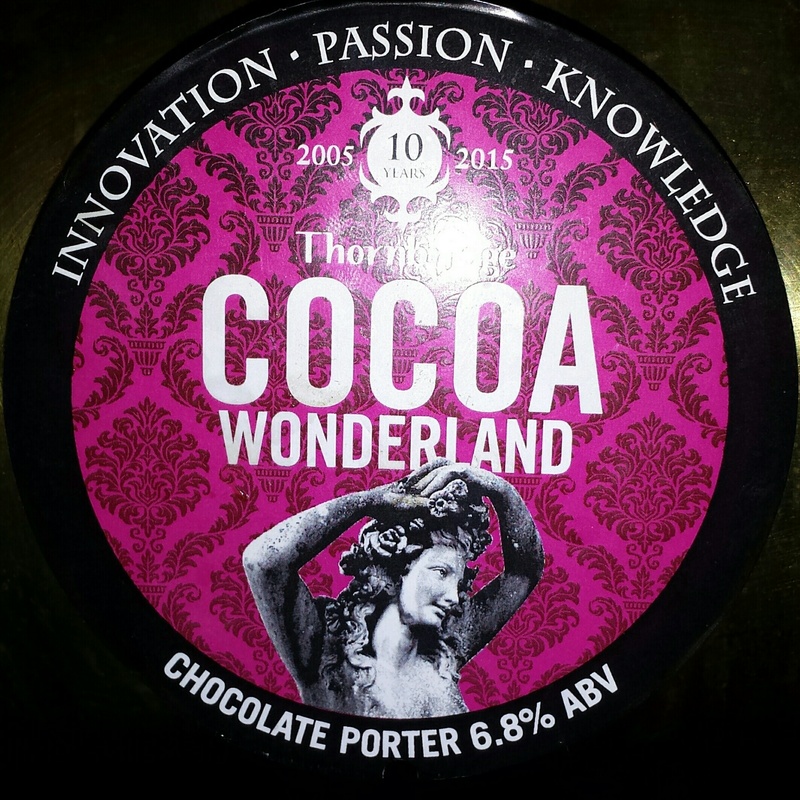 They run a chocolate shop/café in Sheffield called Cocoa Wonderland hence the beer’s title. Each year from October 13th to October 19th it’s national chocolate week in Britain and it’s when the cocoa girls brewed this collaboration with Thornbridge. It also served to commemorate Cocoa Wonderland’s 10th anniversary as a business. They want more women to drink beer and the word experimentation hardly suffices to sum up their ideas. Reading their blog, they’d shine as craft brewsters. They’ve mixed stout with Prosecco – their “black velvet cocktail” and suggest making their Thornbridge chocolate porter into a beer float – serving it in a glass with ice cream! I tip my hat. Dark crimson with a beige spittle. The taste is like abseiling through peat layers. Initial roast coffee and coffee cake. It gets deeper and needier like Tiramisu. There’s an almost petroleum dimension to it. Buzzing finish like the charge I used to get on the tip of the tongue from Sherbert. Sludgy carby body. If you’ve ever plunged your spoon with abandon into the foil seal of a cocoa tin and been enveloped by the “flock” cloud – you’ll understand this tasting note. Brooklyn Brewery is synonymous with the term craft beer. 20% of beer exported from the US is from them. Their flagship beer is Brooklyn Lager, but this stout is as far as you could possibly get from it. Though called Black Chocolate Stout, this beer has no chocolate in it – the massive chocolate hit comes from no fewer than six malts being included in the mash. Hops take a back seat – in fact they’re completely burned out by the simulated cocoa onslaught. when you pour this out, you can’t hold your arm out far enough to conceal the aroma. It comes and assaults you. It’s of dry unsweetened 80% black chocolate. Such a high ABV isn’t conducive to forming a head so you have to twirl it up – it’s a coffee/brown bread brown and doesn’t hang around for long. It’s extremely dry both on the sip and the aftertaste. You both drink and inhale neat black chocolate. It’s the kind that’s used for dusting Kirsch liqueur chocolates. Drinking it is like munching chocolate bourbon biscuits. It dehydrates you, sticking your tongue to the roof of your mouth. It forces you to lick your desiccated lips like a reptile. If it shows anything, it’s how sound an ingredient malt is. Drinkers of pale but massively hopped IPAs should try this – it’s every inch the brute the IPA is. The beers represented here were made by breweries just a few minutes’ walk from each other in Bermondsey. The breweries here have no sunken boreholes to draw their own water from. A lot of the brewing process is necessarily outsourced; there is little chance of kilning or hop growing under a railway arch. Ironically, this makes the world their oyster as they’re not inhibited by what is local. The only thing they could truly bring inhouse is cultivating the yeast (1). They are part of a new trend in public drinking – what you might call focals rather than locals. Apart from a small minority that live in the area, the customers are coming from across and from outside of London. The breweries are part of a phenomenon that reflects both a pilgrimage and a pub crawl. What’s also encouraging is that I see more new breweries employing whichever dispense method they think best serves the beer inside. I love my cask ale but it doesn’t do justice to Pilsners, witbier, Kolsch or sours. I love my keg/key keg beer too but it cannot handle bitter or full roast stout as well. They embody the ideal – choosing the best from each persuasion and often trying them through both. The following three have been chosen under the above heading as mouthfeel or body aren’t adequate to describe what they have to offer. Gose is a beer style that originated in the town of Goslar near Leipzig. It came close to being bombed to extinction as the Kolsch style almost was in the Rhineland. Gose is a sour beer made from a mash that is at least 50% wheat and then soured with salt – either from a sodium-heavy water supply or by the addition of gypsum. It’s also often spiced with coriander and belongs cladistically with other sour Germanic beers like Berliner Weisse or Witbier. Today these styles are probably emulated more out of Germany and Belgium than in them. You’re as likely to see Gose brewed in Bermondsey or Colorado as Goslar. As the name suggests, this beer has been peated by barley grain being dried and toasted over a peat fire. What would happen if you took such sourness and added the smoky boreal sweetness of the ancient mulch? You get a very interesting ale. My mind boggles at the fact that a matter thousands of years old has been used in the making of this. There’s a lot of history in this glass. It’s light daffodil coloured and opaque with a white oil head. The mouthfeel is a glossy cream and one of the most distinctive things about the beer. It reminds me of custard but the texture is much more. It’s a bit like sucking on a salted cloth. The carbonation is gentle on the tip of the tongue. It tastes a bit like carob or a rich sweet flaky pastry like baclava. You then add table salt. The Gose sourness starts to emerge like an apparition. There’s dry white wine. I find it so hard to describe. 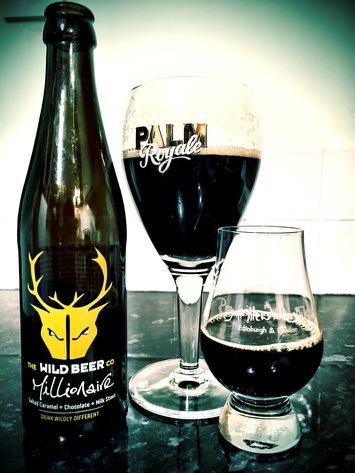 It’s also a bit like white chocolate if you salted it – almost a white version of Millionare from the Wild Beer Co but made in a radically different way. To experience the almost thixotropic (2) quality of this beer, you need to get down to the brewery on Druid Street and have some fresh. This beer was an education to me. I was once asked by my cousin how come the bubbles are actually travelling downwards down the side of a pint of Guinness. I mumbled some kind of an answer but didn’t actually have a clue. Now I know: they’re nitrogen bubbles and they’re heavier than air. Nitrogen isn’t very soluble in beer and when you drink it you get the sensation of something trapped within it. The bubbles will eventually find the pint’s head through the rotation of the liquid. In Guinness, it’s still smarting from the momentum of a pressurised dispense and so charges around. This Nitro Dry Stout was dispensed with the same method. In addition, the tap was deliberately agitated so the liquid fell out in slops and splashes to help the head & creaminess along. As any CAMRA member has been radicalised to believe – nitrogen bad – carbonation from natural fermentation good. This is therefore a controversial choice, but when you outright claim the nitrogen as the beer’s selling point and actually use it for specific effect, it changes things. It becomes an ingredient in its own right. 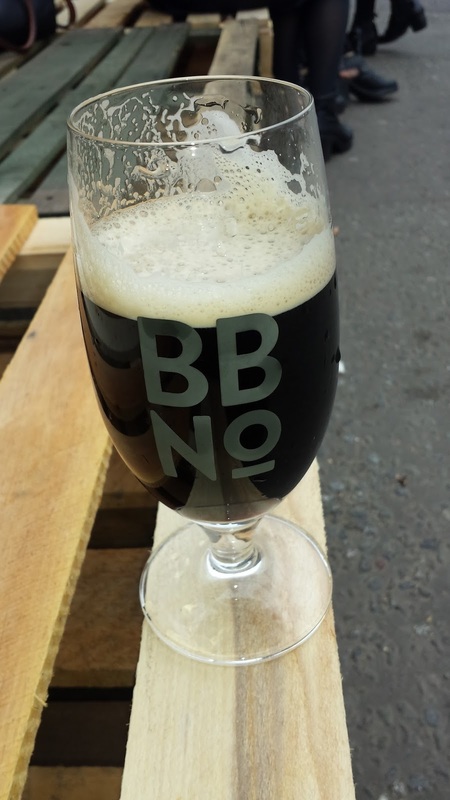 This beer is notable not so much for the easily identifiable flavours of chocolate and coffee but for the texture of the beer and a sensation which seems to wire other senses together. The mouthfeel is glossy – almost emulsified. The sensation is similar to what I experience if a fuse has blown. It’s like burnt ozone and it permeates throughout the liquid and then seems to permeate through drinker like osmosis. I’d never heard of cream ale before. As a style, it comes from the northeast and mid-Atlantic states in America. Traditionally it’s made with rice, corn or both as part of the mash and is often seeded with both lager yeast and ale yeast. The style is often put forward as a competitor to Lager as it’s equally as refreshing and often hopped with Cluster or Brewers Gold. One of the best things about innovation though, is that you get to treat tradition like a buffet – just take the parts you want and then tweak with it items you brought along yourself. This is another beer that has texture sharing equal billing with taste as a selling point. The ale was made by using corn in the mash then seeding the ale firstly with ale yeast which was skimmed off at the surface. Then the temperature was lowered and the beer seeded with a lager yeast. It was hopped not with First Gold or Cluster but Sorachi Ace. This led to an almost oxymoronic creamy comforting texture paired with the sharp piney Sorachi Ace hop. The creamy mouthfeel and hop sharpness are like straddling two roads – one gravel and one tarmac and just cruising along. Increasingly, it’s only in tied pubs you’ll find permanent shields whether it’s ESB in Fuller’s or Bishop’s Finger in Shepherd Neame. I do go back to these old friends from time to time and hope that the drinking of familiar ale honours my memory by replaying it in high definition. To defibrillate the library analogy though, I’ve rifled through those dog eared tomes before and want to explore the labyrinthine aisles for virgin material. The acquisition of new beer is crucial. 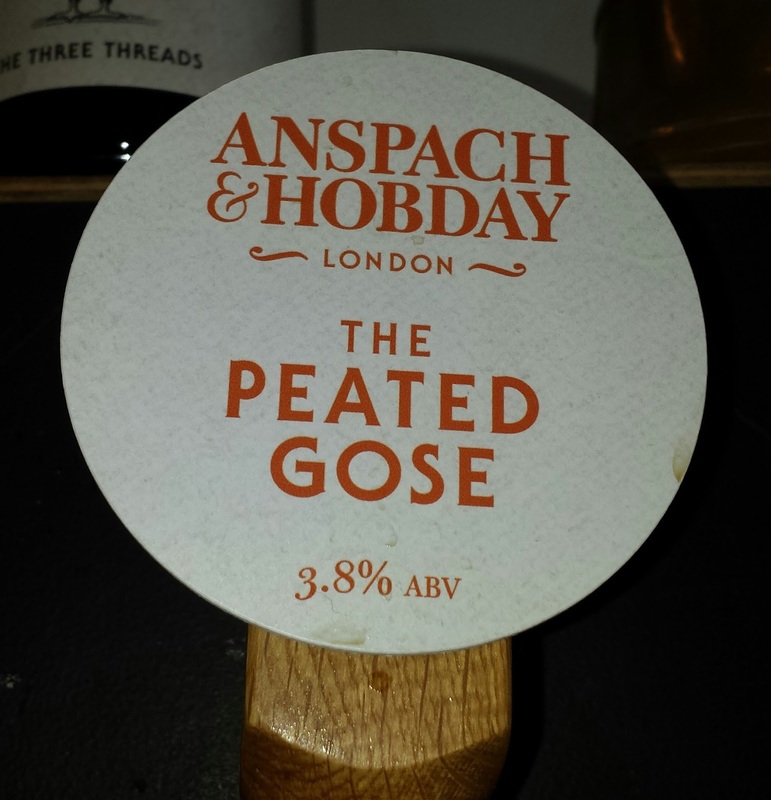 1 – Anspach & Hobday are doing exactly that. Yeast traps have been set around the brewery to trap wild airborne yeasts. Beer will be seeded with it under the title ArchHouse to reflect its railway arch origins. 2 – thixotropic – substances that, depending on whether they’re being poured or agitated, change viscosity but return to the original state. If you’ve ever made custard and watched it run then solidify in runnels from the whisk – that’s thixotropy. I first found this word years ago working for the council. In an emergency situation I climbed over a wall covered in anti-climb paint. It doesn’t come off and clothing has to be destroyed. The paint stays in solid state so it won’t run down the walls but liquefies when you put your hands in it.